Honestly, I fear the question, as who wants to be a prune-faced back-in-my-day-er howling about change most label progress? I’ve rehearsed my answer, picturing the students I teach lugging their stretched-to-bursting backpacks into class. I like them. They smile at me. They thank me. They wave hello, goodbye. The invention of averages hasn’t done much for subtlety. If I say, on average, my students are not as good at reading and writing, then one of the sharpest of my current students appears at an imagined door. I do teach some powerful thinkers, idealists, imaginative innovators. Some revere books and commit themselves to absorbing, testing, and exploiting ideas. The rest are, as a whole, good people. I respect them and would hate offending them. But you hear me winding up. Whether I want an answer, I have one. Unsurprisingly, reading challenges my students most. They seem unpracticed because few circumstances in the rest of their lives expects reading, and it’s a trial to convince them patience matters, that, the more they notice and retain, the more discerning their understanding and interpretation will be. For them, nuance matters less and less. They make dramatic links between disparate ideas but aim for fireworks, not gentle brushstrokes. Skilled at the broadest thinking, they sometimes resemble bots devoted to cursory recognition. Complications, exceptions, paradoxes, and mysteries don’t interest them as much. Instructions falling between extremes tax them. They want to know what’s required. Maybe pragmatism explains their perspective. They’ve been conditioned not to deviate from straight paths. Their parents urge them to fix on destinations with less help getting there. Many parents forget about encouraging joy. To recognize how limitless they might be, students need to struggle and overcome, yet, because minor dents are too costly to their reputations, every accident or setback needs immediate remediation. They hardly have time to stumble or to distinguish between stumbling and failing. They’re told they must not fail and seldom come close. Few experiences lead to the redefinition—refinement—arising from discovering where strengths and weaknesses lie. They’re an anxious generation—of course and understandably. Yet sometimes I wonder why. Granted, we’ve given them a terrible world, but they’re also ready to tell you how much harder they have it, and each challenge can feel to them like too much on top of too much. I long for the student who asks me to be hard, who accepts struggle as fundamental to education. None of what I’ve said diminishes my affection, but it doesn’t lessen my concern either. I generally don’t compare current students to historical ones. I know it could be my problem, my nostalgia for a past that never was. Maybe I shouldn’t speak at all, but there they are, right in front of me, every day. Irene awoke from dozing, the book in her lap finally registering as weight and heat. Soon she’d make dinner, and somewhere in the preparations, her thoughts would light on her husband, how his sigh or grunt signaled his feelings about the meal she’d planned. He was dead ten years now, and she was free from that. But Irene heard him nonetheless. It wasn’t that she missed him, just that he echoed, especially in this solitary space. Her daughter called earlier to report trouble at work, a new boss who didn’t think much of women, and Irene listened as she always did, with more concern than interest. Her days stretched out, not as her cat did—as if trying to release something locked—but, desperately, as toward the finish, its desire dawning as it reached completion. From the instant she roused, Irene thought of ends. She worried she’d taken too good care of herself and might last forever… or that she might at least outlast her money, which might be worse. Her daughter often talked of her marriage, but, as her mother, Irene couldn’t really know her son-in-law. She never had much to add. She appreciated he fixed things and paid stiff deference to her age. She liked his laugh and valued his efforts to make her life easier but felt too tired for affection. Commitment like that was beyond her. Irene found no room for warmth. That stage passed. Instead, Irene wandered in books. They were better than the babbling TV, and sometimes their emotions affected her. They transported her a bit, lifting her to moments she remembered but never discussed. She hadn’t always been old, after all, and couldn’t help returning to images of intimacies that might horrify her children. She didn’t dwell on men who never worked out, but the romance novels she read could recall their hands and the way her own heart rose to meet theirs. Once, her stakes climbed in arousal. Sometimes she still wished for risks younger women take in riding to the brink of release. She counted three weeks since her son’s last call. Like his father, work possessed him, and, when he did call, his mind seemed absent. “Uh huh,” he said, until the sound became an empty rhythm. As a boy, he’d always been distracted, his eyes focused on places and people far from here and now. He was always excusing himself from the table to do something important. She might have known his future entirely then but hoped for more. “A son never loves his mother enough,” Irene’s mother said, and Irene tried to believe it. Shadows lengthened across the carpet. Irene’s husband would have said, “The drinking lamp is lit.” Glancing at her watch, she wondered if she might have another bout of sleep before pulling herself from this chair to make dinner. Her husband never allowed such lassitude. He wanted every destination clear and another meal in the offing. Irene closed her eyes, purple afterimages blooming and fading like bruises. The second part of a long lyric essay on Prospero of The Tempest. The first part appeared last Tuesday. The epilogue to The Tempest shifts strangely from triumph to resignation, even to self-abnegation. In possession of his dukedom again and pardoning everyone, Prospero asks for mercy from the audience. “Release me from my bands,” he begs, “With the help of your good hands.” The footnote tells readers “hands” means applause, but it doesn’t have to—Prospero could as easily be seeking succor, intimacy someone of his power and intimidation may be denied. His supplication sounds nothing like victory. Who sets us free from our own feelings? Who convinces us that we’re in the right spot now, that this new balance of gains and losses is better and that we’re ourselves at last? Writers like Jean Anouilh link tragedy and discovery, suggesting tragic figures reach self-knowledge only the hopeless can. When escape and delusion become meaningless, when alternatives whittle to one, tragic figures see themselves more honestly than other mortals might. There’s no squirming, no final evasions, subterfuge, or denial. But Prospero is no tragic hero—he achieves his desires and undergoes no downfall. Does he share a tragic hero’s awareness? Attaining his previous position shatters his understanding of himself and his place. His return to Duke of Milan may be the proper resolution of events, but he lost the job originally because it bored him. And his successful retribution, instead of filling him with confidence and power, illuminates his misunderstanding of himself, a new desperation, and an awareness—albeit a dim one—of his own crimes and need for mercy. He sees his own flaws in trying to make others pay for wronging him. But he isn’t dead yet, and, I wonder—as his every third thought of death arrives—if he still has a tragic hero’s desire for relief. It’s cliché to say Shakespeare changes as you age, but I identified with Caliban the first time I read The Tempest. Caliban is acted upon, unappreciated, and distressed. As Prospero’s plaything, he relies on the fuel of resentment. He is in every way compelled, denied choices and given no proper spot on the island or anywhere else. He isn’t pretty or nice, but he burns in ways Prospero doesn’t. In comparison, Prospero’s battles seem willful, fitful, and arbitrary. Prospero is the master and what right does he have to be unhappy? Some readers may say the epilogue of The Tempest completes Propero’s arc from anger to humility. He hasn’t enjoyed winning as much as he thought and seeks universal amnesty and calm instead. If that’s so, he will make a lousy duke to Milan. His brother the usurper has greater initiative and confidence. His brother wants the job and looks to no one for relief. You can grow tired of wanting, particularly when you’re unsure why you want, whether an ambition you distrust can be real, which uncertain alternative can bring joy. If, as many believe, Prospero is a surrogate for the retiring Shakespeare, the play’s grace note feels like an exhausted surrender. Prospero appears to want nothing more than to drop his instrument and walk from the orchestra unnoticed. He is not the same person we met. The vehicle of his transformation is not killing others or harming others as a tragic hero’s might be, but he does kill—willingly—a part of himself. Maybe, in casting off his slaves, his magic, his daughter, his autonomy, and his desire for revenge, he hopes to see his raw self, the self he will be when he slips into that last powerless sleep. I wonder if he does. Compared to Prospero, many more thoughts intervene between my thoughts of death. But I understand more now. When ambition achieved, unachieved, formed, or abandoned fails to satisfy, when ambition seems itself positively punishing, it’s natural to desire rest. The first part of a long lyric essay on Prospero of The Tempest. The second part will appear Saturday. In the last act of The Tempest, Prospero describes his impending escape from his island exile and his eventual return home. He will first sail to Naples to see his daughter Miranda marry into a handy alliance and then travel to Milan where he will be restored as Duke. How does success make him so unhappy? The Rolling Stones tell us we can’t always get what we want, which is true, but we also know we should be careful what we wish for in the first place. Sometimes what we wanted isn’t what it pretended. Aspiration looks good from afar, but capture can be less fulfilling than pursuit. I sometimes tell my students they shouldn’t take my criticism so hard because an essay without flaws might be more curse than boon. Write the perfect essay and what would you do tomorrow? Fruition invites redefinition. Having done something means something more to do… someone else to be. Among Prospero’s final deeds is shedding his books, staff, and magic. Nothing makes that step necessary—being naked of magic isn’t a condition of his return—but he decides that, once he’s redressed all the wrongs against him, he won’t need his powers. He frees one beloved slave and another not-so-beloved one with the words, “This thing of darkness I acknowledge mine.” He forgives deceivers who wronged him and ends twelve years of isolation. Yet he seems melancholy. He never quite says so but swings between satisfaction or surrender. As the action of the play ends, he invites the usurpers and schemers into his cell to hear how he has lived, how he survived and thrived in the harsh island’s conditions, his glee with where he’s been more vivid than his anticipated return to civilization. Sometimes we want things because we think we ought. Envy makes us desire what others have attained because, after all, we feel just as able, or think we are. “What about me?” the greedy heart cries and incites clumsy effort to find its proper place. Getting there may promise little pleasure—quite the contrary, you may feel you cut cross-grain against deeper, more immediate and comfortable desires—but it’s not always easy to distinguish between should and ought. Should sounds gentler. Ought suggests some grander, more dubious, aim. Ariel, the slave Prospero likes best, brings dispatches—the status of the villains Prospero tests and torments. Some of them suffer. They’re ignorant of Prospero’s plan and its happy conclusion and know only their grief and torment. Prospero is often so defensive. Part of him wonders if his unjust usurpation arose from an accurate cause. Part of him knows his plans aren’t harmless, yet he didn’t consider how others might feel. Worse, he hasn’t examined his own feelings, whether his longing is so important he can abide becoming a stranger to himself. When I came to Chicago almost ten years ago, it was as the chair of the English department. My old school had become predictable. My place there was—and appeared would always be—a younger brother, a role I know well. I’m used to being George, not Paul or John, nor even Ringo, who has the good sense to choose humor over earnestness and anarchy over hierarchy. It took six months to recognize the person the job required and how different he was from me. I was competent in the skills and vision required but incompetent in desire. The job wasn’t beyond me, just beyond my perseverance. I played the role for a while because I refused to surrender, to give up an exalted sense of capabilities I didn’t care that much about proving. And when I stepped down after two years, I felt no better. Whether I called it quitting or others did mattered little. For another year, I thought I should be chair and, since I should be, I ought to be too. Yet I’d sacrificed my spot and couldn’t go back. Each decision is sacrifice, one alternative dying for another. You may find a means to return but will have to confront the choice that necessitated doubling back. You won’t know whether you were right all along or right now, and, in that case, both are wrong. I distribute a list of Henry David Thoreau quotations, one to a customer. Some people say, “I don’t understand” or “What’s he saying?” But one voice cries out, “Is he serious? 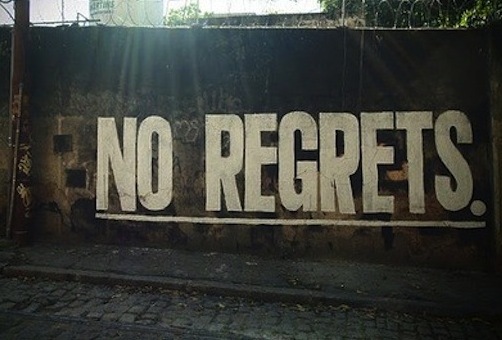 In mine, he’s saying we should have regrets. Our petty regrets seem unavoidable. We all regret eating too much or arriving late or not leaving the office sooner to miss the highway rush or forgetting an appointment we shouldn’t have or blurting out what we’d like to take back. Those regrets we endure. We must endure them. On the grander scale, however, we want to be happy with our decisions and our lives. We want to be comfortable and satisfied or, at the very least, come to terms with whatever transpired—no regrets. Another truth of our time is that the past has passed, and we ought to point ever forward. Progress demands putting yesterday behind us. Newer and better things lie ahead if we direct attention to the future. There’s no sense in dwelling, no sense in mulling, no sense in revisiting. To get over it, we must forget about it, and what happened happened. It’s done. Thoreau believed we couldn’t move on without knowing how to. We might fall into the same error, after all, if we pretend today never occurred and don’t fully acknowledge the how and why of events. He believed in studying experience, not running from it. Even carpe diem requires forethought. “But if that’s what it takes…” I start to say. Everyone knows the old saw about history, how anyone ignorant of it is bound to repeat it. I offer that idea instead. I ask what—exactly—it means to “smother sorrow” but meet impatience. Perhaps it’s unhealthy to smother sorrow, the conversation runs, but should we wallow in it? What does an “integral interest” even mean, anyway? And, as far as tending and cherishing sorrow, well that’s crazy, hardly worth discussing. Some days little seems worthy of discussion. In 1839, when Thoreau wrote these sentences in his journal, perhaps he didn’t know exactly what he meant. Perhaps he was exploring, trying to examine connections between yesterday and today. Maybe he wasn’t sure and only posited an alternative to blind life, the uninterrupted and unstudied march most of us make each day. As his journals were private thoughts not clearly intended for publication, he could have uttered them only to himself, to spur the best life he could live. I wonder, though, if that makes his ideas more or less valuable. Here is a person speaking to us from the past. Should we dismiss thinkers before us? Can we discount them so easily, without regret? I’ve been ill this week and haven’t the concentration or will to write much, so I’m posting 15 opening lines for imaginary fiction. I’ve also supplied pretend titles and years to reflect styles of the time, and, yes, one uses dialogue. If you read a lot, you may recognize I’m parroting writers I’ve encountered.